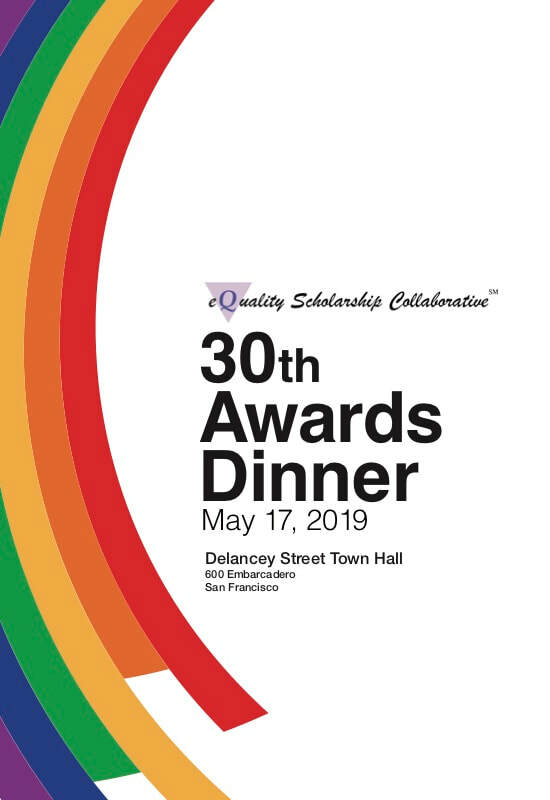 The 2019 eQuality Scholars will be announced at the 30th eQuality Scholarship Awards Dinner on Friday, May 17, at Delancey Street Town Hall. Tickets are $99 each and must be reserved in advance as space is limited. Please use the form below to purchase your tickets. RSVP by May 8. Transit: Delancey Street Town Hall is 7 blocks from the Embarcadero BART/SF Muni Metro station and across the street from the Brannan St & Embarcadero Muni Metro stop. Parking: The Bayside parking lot is one block north and costs $10 for the evening after 5 p.m. Metered street parking costs $0.50/hour after 6 p.m.
"This is a community that gets told 'no' a lot, and, so, I can't possibly articulate how much it means to me to be in this type of room, where it's not 'no', it's 'yes'. And we're celebrating, we are having joy, we're having pride, especially in all of us, in each other, and we're able to celebrate our accomplishments, and be who we are, and be able to celebrate our identities and ourselves. And, so, that means the absolute world to me." “PG&E” refers to the Pacific Gas and Electric Company, a subsidiary of PG&E Corporation.